Bon Apetit! A following directions book with manipulatives! Let me start off by saying I am so sorry for how long it has been since I last blogged. It's been a disastrous week of midterms, stomach bugs, and overall insanity. ANYWHO, I'm back and in action! I've got a great new activity for you guys to try out that works amazingly with non-verbal kiddos! 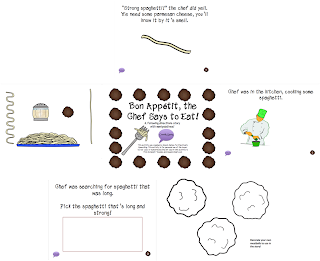 If you liked my "Hey, little clover" activity (find it here), you're going to love "Bon Apetit, The Chef Says To Eat"! !